Fresh or frozen trout is a tasty addition to a healthy-heart diet. In fact, the American Heart Association recommends eating two servings of fish that's rich in omega-3 fatty acids each week. Though saltwater fish like salmon and herring may have the highest levels of omega-3, fatty types of freshwater trout, such as Rainbow trout, also contain significant levels of this cholesterol-fighting nutrient. Trout is typically eaten as a whole fish, but may be filleted or chopped for preparations such as hash. Choose fresh whole trout that's shiny, smells pleasant and mild and has firm flesh and clear eyes. Avoid frozen trout that's in a damaged package or has visible ice crystals. Rub the inside of a trout with a small amount of olive oil. Add salt and pepper to taste. Stuff the fish cavity with fresh herbs such as parsley, tarragon and/or dill. If fresh herbs aren't available, use strips of fresh vegetables like carrots, peppers or celery. Place thin slices of lemon on top of the herbs or vegetables. Tie the trout closed with cooking twine. Sprinkle the skin with salt and pepper. Place the trout in a grilling basket to cook it on the grill. Cook on a hot grill approximately 10 minutes on each side per 1 pound of fish. The skin should be crisp and the flesh, flaky. 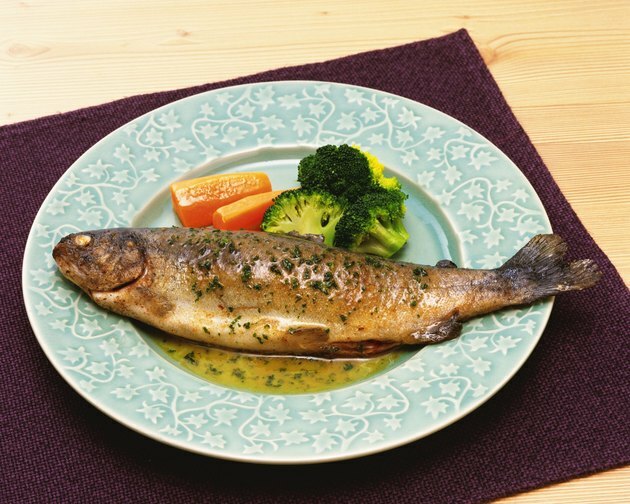 Lay the trout in a lightly oiled oven-safe dish to bake. Place it into a 350 degree Fahrenheit oven and cook for 8 to 10 minutes per pound. Turn gently with a large spatula halfway through the cooking time. The flesh should be flaky and moist and the skin should be slightly crisp. Cut the cooking twine and remove the herbs/vegetables. If the trout was deboned before cooking it is ready to eat. If it was cooked with the bones in, gently slide the flesh away from the vertebrae and small bones to eat. The mild flavor of trout works well with a variety of flavor profiles and can be used with strong seasonings such as cayenne powder, ginger, soy and garlic. Smaller fish can be battered and deep fried whole for a version of fish and chips, and large trout can be stuffed with diced potatoes, bacon and spinach for "one-pot meal." Some people find the skin of the trout to be very flavorful, especially when it is crispy. Most trout that's sold commercially will come precleaned and with the bones intact. To learn how to fillet your own trout, see the resource section of this article. Smoked trout is a delicacy that can be enjoyed similarly to smoked salmon. Serve it for breakfast or lunch with eggs, bagels and cream cheese or with crunchy crackers as an hors d'oeuvres. Trout that's been filleted may still contain small bones. Use caution when eating and carefully inspect for bones before serving trout to a child. Women that are pregnant or breastfeeding are cautioned against eating fresh smoked trout or fish that's been exposed to industrial pollutants.